The Rialto market is a large fruit and vegetable market in the centre of Venice. A large fish market is connected, where a lot of fresh fish from the nearby sea is sold. 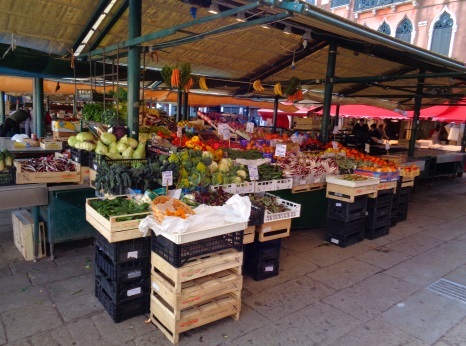 The Rialto market is directly on the famous Canal Grande, only 5 minutes walk from the world famous Rialto Bridge. Venice offers countless tours, guided tours of the city, tours of the city, etc. Some are good, others less good. Very good reviews gets a tour that deals with the local food and culinary of Venice. You go in a small group with a very good guide through taverns and bars. Our guide Veronica showed us a lot in 2,5 hours. Since the group is rather small, personal contacts quickly develop. The Rialto market is also part of this culinary tour through Venice. Rarely we have experienced a more interesting city tour. The tour costs only 29 Euro including some snacks in small restaurants. Above all you can try many Cicchetti. typical for Venice (similar to the Tapas in Spain). The area has been one of Venice's most important trading centres for centuries. The region around the market of Rialto is a little higher than most parts of the island and is therefore not so often flooded during Venice's floods. 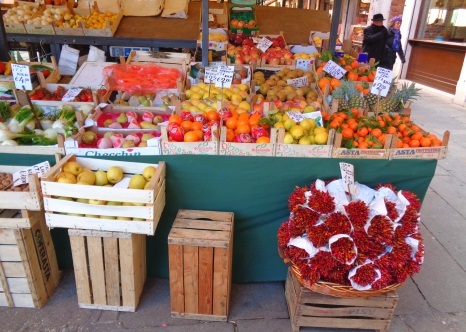 The colourful fruits and vegetables on the Rialto Mercato come in part from the sparsely populated vegetable island of Venice Sant'Erasmo in the north of the lagoon. Sant'Erasmo is famous in Venice for its artichokes. But also green asparagus, green salad, tomatoes and much more from the vegetable island are known among the Venetians for many centuries. Today, of course, a large part of the fruits and vegetables are also imported to the market of Rialto. Even more impressive for most tourists is the huge fish market (Pescheria) next to the fruit and vegetable market of Rialto. 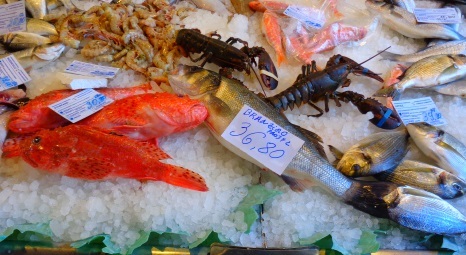 Fresh fish from the Adriatic is offered in all possible shapes, colours, sizes and price ranges. Besides fish, there are also seafood, crabs and the like (see picture below). Even more famous is the fish market of Chioggia in the south of the Venice lagoon.. Behind the market there are several butcher's shops in small buildings next to each other. The traditional butcher's shops have existed for centuries and are still well visited today. In one of the butcher shops next to the Rialto market we discovered horse salami and donkey salami (see picture below). 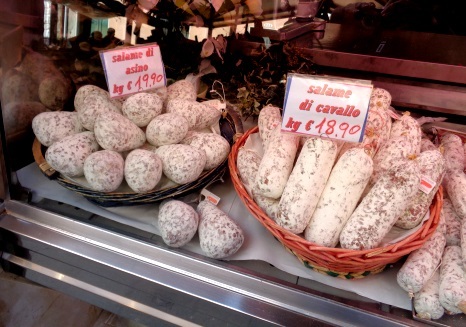 Durable sausages, such as the delicious Italian salami, can possibly be taken home as a souvenir from Venice. The Rialto market is also known for the many small bars in the area. They are still meeting places for the locals. Here the Venetians like to drink a Prosecco, an orange Aperol Spritz or a coffee with friends. The croissants (Italian: brioche) in the bars, which are often still warm in the morning, are delicious. They seem to be the favourite dish of the inhabitants of Venice for breakfast. Those who want to see the real market life with the locals should come very early. Many citizens of Venice come to the central food market between 7:30 and 9 am. Afterwards, as many things in Venice, the Rialto market is more and more flooded by tourists. But it has remained a real market for the locals. Tourist kitsch is only sold at some stalls at the edge of the Rialto market. For the 60,000 citizens of the island, the market of Rialto is very important. There are less and less supermarkets, butchers and fish shops in Venice with normal offers and prices. Even though the market is certainly not one of the cheapest in Europe, the fresh produce market is one of the less affordable ways for the inhabitants of Venice to buy fresh food. Of course, it is also a good place for tourists who have rented a holiday flat with a kitchen in Venice. The fresh fish and the artichokes are our special recommendation. Also for the purchase of oil, spices and the like, the market of Rialto is not a bad address. Opening hours Markt Rialto 2019: The market is open every day except Sunday and holidays. The official opening hours are 8 am to 4 pm. However, many sellers dismantle their stands at the Rialto market around 1 p.m., especially in winter. This is especially true for fishmongers. The best time to visit the market is from 7:30 a.m. to 9:30 a.m. Anyone who can't come so early should come in the morning: The earlier, the better. In Italian the market is simply called "Mercato di Rialto", in English "Rialto Market". The fish market in Venice is called "Pescheria". Officially the fish market of Venice seems to be called "Mercado del Pesce". This is at least what it says on the wall at the entrance. The fish and seafood are sold in an interesting neo-Gothic hall (19th century). How to get to the Rialto market: Right in front of the market square on the Grand Canal is a stop for public ships (water buses) from Venice. Attention: As far as we know only the Vaporetti line 1 stops here. Line 2 and others leave the station and pass the famous market place of Venice. The Rialto market is a good 100 metres north of the famous Rialto bridge. As a pedestrian, one should pay attention that one is on the right side of the Canal Grande. Otherwise you have to cross the bridge. There is no bridge at the market. The market area is directly at the Canal Grande in the centre of Venice.